Until his mother passed away, he was the typical Indian man with no role in the kitchen. And then, a chance trial at making of buttermilk brought K Natarajan into the taboo space, and then there has been no looking back! The kitchen is now a space where he experiments, explores and creates joyous moments. His wife, Manjula, swears by his tomato shorba, potato fry, kattarikkai saadam (aubergine rice), avarakkai saadam (broad beans rice), and of course his signature buttermilk with the juice of banana stem. 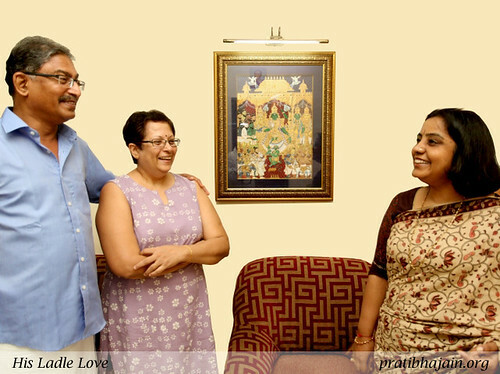 The 59 year old Tamilian, a Chartered Accountant by profession, lives in Chennai with his wife and son. He is a great believer in the OPOS cooking, a path-breaking method systematized by foodie Rama Krishnan of Chennai. I met Natarajan at his cosy home in Chennai to chat over steaming hot idlis and a variety of chutneys fresh from the kitchen. Namaste. Before I quiz you about OPOS, tell me when where you discovered your love for cooking? A discovery in life, just about three years ago! I come from a traditional Tam-bram family from South Arcot, a district in Tamilnadu where men had no role in the kitchen. I have never ever seen any men from our household enter the kitchen – neither my grandfather nor my father. A few months after my mother passed away, I found myself wandering in and out of the kitchen. I started experimenting with simple recipes. How did you nurture your newly discovered interest ? Manjula (wife): By nagging me! He would stand beside me and go on questioning me about ingredients, vessels and the way I was cooking. Invariably, I would request him to leave the kitchen so I could get on with the cooking. Natarajan: I like to know why a dish is prepared in a certain way. I would ask her about alternate ingredients and cooking styles! She says I am more of a laboratory scientist than a cook. She laughs at me while I make the buttermilk because I do the distilling with different strainers and take more than half an hour over it. My argument is that since I only cook once in a while, I can afford to be unhurried and meticulous. Manjula: But honestly, his interest in cooking was kindled by OPOS. When I told him that the entire cooking could be done in a pressure cooker without using any other pots or pans, he was so fascinated. Kindly elaborate on OPOS for the benefit of our readers. OPOS stands for ‘One pot one shot’. This is a term coined by Chennai foodie Rama Krishna who has brought out a cookbook where dishes are prepared in the pressure cooker in one shot. Right from the seasoning . It is a simple procedure which demystifies Indian cooking. Many people have adopted this way of cooking. It preserves the nutrients and enhances taste. When Manjula started following this method, I was quite enamoured and tried my hand at a few recipes. The rest, as they say, is history. Please give me an example of an OPOS recipe? I enjoy making a rice dish with broad beans. I start with the seasoning in the pressure cooker, add the broad beans, spices, rinsed rice and enough water. I pressure cook for up to 2 whistles and in ten minutes, the dish is ready. As simple as that. You can replace broad beans with any vegetables of your choice. Are the flavours captured well by OPOS? How would you compare it with childhood food flavours? In OPOS, the flavours are preserved because of the pressure cooker. Childhood memories are something else. They are connected to festivals and celebrations. I grew up in a typical traditional house with courtyard and back. I remember how large the kitchen was-almost 1200 sq ft! During festivals and family functions, a stove would be dug up in the backyard which had an area with a tiled roof. This stove, known as kottai adappu, was like a linear rectangular trench one foot wide, 15 feet in length and 1.5 feet depth. Once dug, firewood would be added as fuel. Then the cooks would place huge vessels on this stove and cook rice. I distinctly remember the jute cloth which was used to strain the rice. Even for small functions, at least 150 people would gather. During Krishna Janmashtami, two ladies will pound rice with a wooden pole known as ulakkai. The powdered rice would be mixed with salt water and spices to prepare murukku. I remember how we children would sit and watch my mother, hands on our cheeks, waiting! So you were very fascinated by the happenings in the kitchen. This is so true. It was just that there was never any need to enter the kitchen. I was also the only son born after four daughters, so I guess I was totally pampered. To add to that, my mother-in-law also started living with us. So between my mother and mother-in-law, there was really never any need for me to enter the kitchen. This is fascinating. Please tell me more about these two elderly women at home. Soon after Manjula and I were engaged, her father passed away. Manjula is the youngest of four sisters. So after our marriage, her mother was alone at home. So my father told her that she is like a sister to him and that she must come and stay with us. She agreed and moved into our house. My mother and she got along like a house on fire. They went shopping together, cooked together, watched English, Hindi and Tamil movies, enjoyed television serials and had a common taste in reading as well. After my dad passed away, they became even closer. When my mother-in-law passed away, my mother missed her very much and passed away within a year. How did your family and friends react when they found out about your newly discovered love for cooking? Pleasantly surprised, I guess. When her sister visited us recently, I asked them to enjoy their shopping spree one evening and told them I will handle the dinner. Manjula (wife): I still remember how surprised my sister was when we returned and found that he had actually prepared dinner with rice, potato fry and rasam. His rasam is like a delicious tomato shorba! Do you also participate in online food communities? I am an introvert by nature and stay away from social media. My wife, on the other hand, is an active member of the facebook group United by Food where she shares her passion for cooking. I believe that true joy can be found in real relationships which exist in this real world and not in the virtual world of the internet. No amount of arguments put forth by my friends or my wife has convinced me otherwise. P.S: In all the photographs of this post, you can see a Mysore Painting which is almost 170 years old. It is called Ramar Pattabhishekam. Mysore painting is an art form older than Tanjore painting and does not have stone embellishments. Natarajan says that this has been in his family from his great-grandfather’s time who is said to have worshipped this painting with lotus flowers. About a decade ago, the base of the painting developed cracks; they took it to an art gallery for restoration, when the antiquity of the painting was further affirmed. First published in October 2014 in Harmony – the Indian magazine for silvers for the column – ‘His Ladle Love’. A series about men who experience the joy of cooking and can weild a deft ladle in the kitchen. Part-2 of this post is the recipe of Broad beans rice, a simple and delicious OPOS dish by Natarajan.